136 West Houston is a brand new development situated at the nexus of Greenwich Village and SoHo. Blending high-end finishes with contemporary open plan layouts, each of the building’s 6 residences epitomize modern city living. Every residence within 136 West Houston contains 3 bedrooms and private outdoor space. Additional features include floor-to-ceiling windows, Italian Poliform custom kitchens equipped with an eat-in island, custom Poliform closets, high-end appliances from Sub-Zero and bosh, sleek countertops, backsplash, and Hansgrohe shower fixtures. 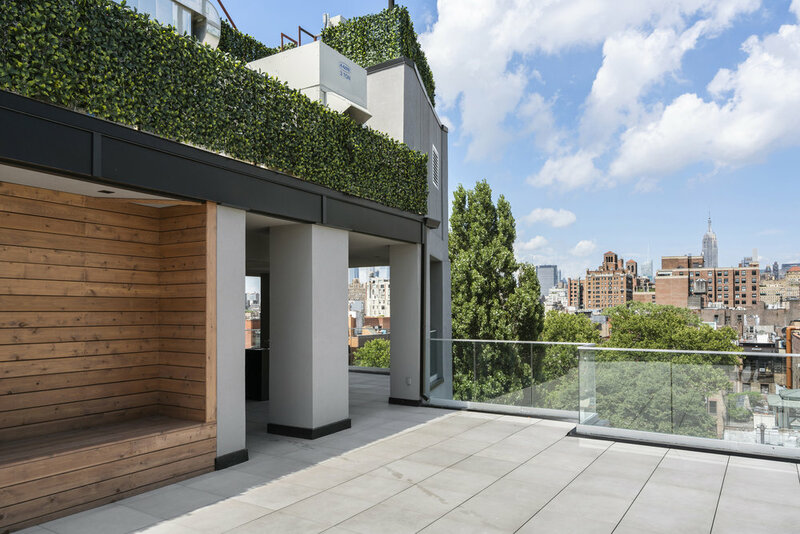 Each residence also features highly sought after views of the MacDougal-Sullivan Garden. The building is located just three blocks from Washington Square Park and is surrounded by a number of trendy restaurants, cafes, and bars. Carbone, Blue Ribbon Sushi, Dominique Ansel Bakery, Jack’s Wife Freda, and Blue Hill are all not to be missed. The shopping district of SoHo is less than 5 minutes away, as are numerous theaters, galleries, and clubs. Nearby subway lines include the 1/A/C/E/B/D/F/M/6. Greenwich Village, often referred to by locals simply as “The Village,” is a largely residential neighborhood on the west side of Lower Manhattan with narrow, curved streets full of historic character and charm. SoHo, whose name is derived from its location “SOuth of HOuston,” is one of Manhattan’s trendiest neighborhoods, and is noted for being home to many artists’ lofts and art galleries, as well for its fine dining and wide variety of shops, including chic boutiques and upscale international stores. Historically significant, Greenwich Village, known in the late 19th to mid-20th centuries as an artists’ haven and the bohemian capital, played a central role in the writings of Jack Kerouac, Allen Ginsberg, Truman Capote, and Maya Angelou. Similarly, SoHo was once occupied by artists permitted to live in spaces that did not meet residential building codes. In the ‘80s the neighborhood began to draw affluent residents, and while many of the original pioneering artists remained, SoHo has become a highly desirable location and is now home to some of the most expensive real estate in the country. Shopping in Greenwich Village and SoHo are two truly unique experiences unmatched anywhere else in the world. The Village is a great place to find the treasure you can’t live without, with its myriad of shoe shops along 8th Street and one-of-a-kind boutiques. Meanwhile, SoHo is New York City’s quintessential quadrant of downtown chic. It’s a popular destination for people seeking fashionable clothing, with its trendy boutiques and upscale designer stores. When the sun is out, historic Washington Square Park is the center and heart of the neighborhood, featuring street musicians and performers, food carts serving dishes of all types, outdoor movies, and local festivals, all in a beautiful, green oasis. When the sun sets, Greenwich Village and SoHo truly come alive, and the choice of nightlife venues is nearly endless. Enjoy stand-up comedy at the world famous Comedy Cellar, jazz at Smalls, or rock n’ roll at The Bitter End, a legendary venue that has been home to artists such as Stevie Wonder, Norah Jones, and Lady Gaga. With their vibrant selection of shops and restaurants, Greenwich Village and SoHo are two of the most sought after addresses in the city. Celebrities that have called the neighborhood home include Emma Stone, Justin Timberlake, and Sarah Jessica Parker. Welcome to the neighborhood! Centrally located, Greenwich Village is served by the A, B, C, D, E, F, M, L, 1, 2 and 3 trains and by MTA buses M5, M7, M11, M14 and M20. Transportation to and from SoHo is available by taxi or MTA bus routes M1, M6, M20 and M21, and blue (A, C, E), yellow (N, R, W) and green (6) MTA subway lines. In addition, the red line (1, 2, 3) has stops on both the north and south borders of the neighborhood.